Here at SureSlim you'll receive a unique weight loss plan specially formulated for you. Your program will be based on your comprehensive blood test results and customised to suit your lifestyle and food preferences. There are no pre-packaged foods, no shakes or pills, just real everyday food you can buy in your local supermarket! 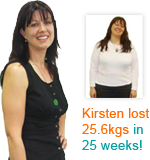 You'll also get a FREE weight loss coach, with one-on-one phone or Skype consultations ensuring you get the support, encouragement and advice you need to reach your weight loss and health goals no matter where you are in New Zealand.